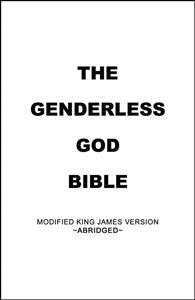 THE GENDERLESS GOD BIBLE is a modified abridged King James Bible, with a new point of view. A choice for those with open minds to explore. The reader will be experiencing this historical document with a gender neutral perspective—as it applies to God—for the first time. This is not a completely gender neutral Bible. The main element is a focus on God as genderless. Without God presented as a male gendered entity, fresh influences and images become apparent in the mind of the reader. Illuminating a new perception of the potential nature of God. This book is very simple but it does leave the reader with a different feeling about God than standard bibles. You kind of walk away from it feeling that the other versions were written by men just to give men the ability to control people (women especially). It is a little raw. In many places the word "God" replaces "He" but the overall effect is real and positive. I would highly recommend it.